My name is Mike and I am a shopaholic! I have been busy scouring the shops for new and inspirational buys and thought I would share some of my favourite buys with an Autumnal palette in mind. From the burning yellows and reds of the changing leaves to the moody grey skies, this scheme definitely has drama! My ongoing fascination with the geometrics trend is seeing no end in sight, which is hardly surprising with bold and striking designs like the Rug Geometric (1) £155 from Idyll Home. If you are looking for striking floor detail, this is the rug for you. I am a huge fan of chocolate (2) but even more so when it's wrapped in a duck egg blue & gold geometric wrapping and all from far away Vietnam! The added bonus here is that dark chocolate is reportedly good for you too...right? Marou dark chocolate bar, £7.50 Harvey Nicholls. I love the bold and vibrant fuschia pink of the OMG greetings card (3) from Big Jon £3.50 (have you checked out his quirky instagram page?). I like to keep a handy selection of eye catching cards and postcards to put up around the house for added interest and detail. I am a huge advocate of taking interior design outdoors and if you are looking for a striking statement in the garden, then look no further than this Zinc Provence planter (4) £65 from Idyll Home. Have you seen the gorgeous mustard yellow Locksmith print by James Brown? (5) £65, one of many fab, fun and colourful prints available from Bloomsbury Store. Try adding quirky artwork to a funky kitchen space for a relaxed feel and prints bring personality to a space. 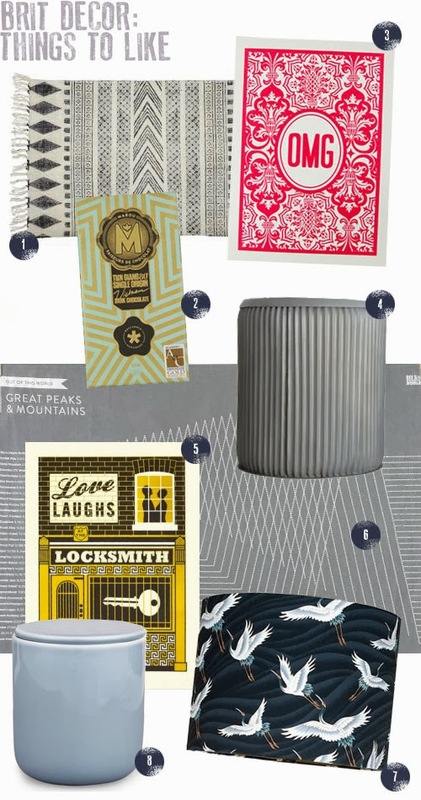 There is also the line-tastic Great Seas & Oceans tea towel (6) £10 from Bold & Noble which is perfect if you want some urban styling. I recently stumbled across lampshade designer, Sweet Mei, on Twitter and her Flying White Crane lampshade (7) £34.99 is just so elegant - the cranes look stunning against the navy background and remind me of birds migrating for the winter. I hope this design flies into my home! Also from Harvey Nicholls is Menu, a Norm Thermo Cup (8) - just what I need for those chilly Autumnal mornings and aptly in this beautiful frosty pastel blue. I love it when design meets functionality and this cup certainly has just that with its double isolating walls for added insulation, £12.95.